How to Garden › Help! My Lettuce is Bolting. What to Do? Help! My Lettuce is Bolting. What to Do? Newly minted (ha! Get it?) vegetable gardeners can be taken by surprise when their beautiful lettuce plants they’ve been enjoying since the beginning of the season start sending up flower stalks all of the sudden, and go to seed. When this happens, the heretofore sweet, tender lettuce leaves become tough and bitter, rendering them unpalatable. This is called bolting, which is very common for cool season leafy greens such as lettuce, arugula, cabbage, collard greens, kale, and spinach. Other plants prone to bolting include herbs such as basil, dill and cilantro, as well as broccoli and beets. Normally, we regard plants’ flowering as a good thing, but not in the case of plants we enjoy for their nutritious green leaves. These plants flourish in the cool temperatures of late spring/early summer. But, the extended daylight hours and hot temperatures of mid-summer signal they’ve reached maturity and are nearing the end of their life, prompting them to reproduce by setting seed. What to do about Bolting? Bolting is a natural, inevitable process which can’t be prevented. However, there are ways to manage it, depending on the plant. For starters, you can plant seed varieties that are characterized as heat resistant or ‘slow bolt’; this may buy you some extra time. 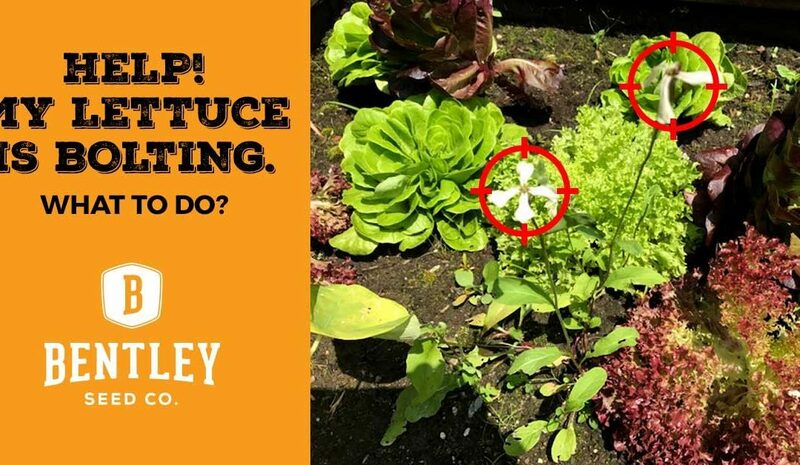 You can also grow lettuce in a partially shady area where it will stay relatively cool and delay bolting. Other plants demand different tactics. Basil, for example, loves sunny, hot and relatively dry conditions, which, of course, cause it to bolt, but you can deal with this by simply snipping off the flower buds as they appear. Regardless of flowering, tall, leggy basil plants are not desirable; keep them pinched back to keep them healthy. This is easy to do in the course of pinching/cutting off leaves for regular consumption in kitchen. In spite of your best efforts, don’t despair if all of your leafy greens end up setting seed. Just dig them up and plant new seeds for fall harvest. Given the speed with which lettuce and other leafy green seeds germinate, depending on where you live, you will be able to harvest a successive crop before the frost hits. Remember, these plants welcome cool early fall temperatures. One of the great things about gardening many people don’t appreciate until they start doing it is it’s an ongoing opportunity to learn about nature and the cycle of life. Similar to many gardening terms, “bolting” sounds vaguely daunting. As it turns out, it’s actually an apt word that describes a natural, logical process. For many of us, gardening is an infinitely more interesting way to learn than sitting in a classroom listening to a Biology lecture.